Your sleuthing has landed you in the middle of a huge Team Rocket operation headed by a sinister figure known as Giovanni. The man in the slick suit at the rear of the Game Corner is actually guarding the entrance to a secret, underground lair. Giovanni has a prototype Silph Scope that can identify the ghosts back at Pokémon Tower. Don't let him escape! Take down the Rocket in front of the poster (whose Pokémon stats are to the right). Once he leaves to alert the other Rockets, flip the switch to reveal a secret staircase leading to Team Rocket's underground hideout. The key to reaching Giovanni's office is literally that — a key. The Lift Key that operates the elevator is on the fourth floor down. From the entrance, follow stairways A and B to the third sub-basement. 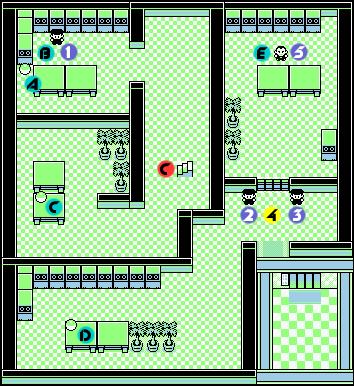 Make your way through the maze to stairway C. Battle ROCKET in the upper-left corner to receive the key, then go back upstairs to the first basement. Take the elevator down to the fourth basement and Giovanni's office. There are valuable items and Team Rocket members everywhere, and it's wise to take the time to deal with all of them before you leave. 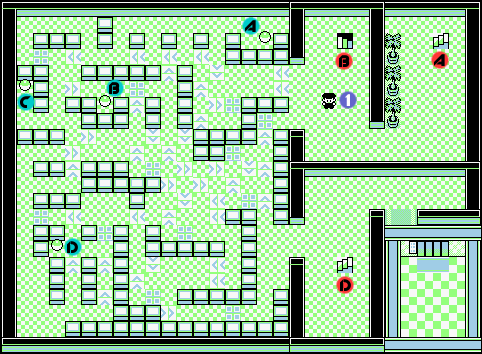 For starters, the bottom-right planting pot in the entrance hall holds a hidden PP Up. Sections of the basement are covered in special tiles that move you automatically from one place to another. You can't control this movement, but arrows on the tiles show you which direction they'll take you, while "checkboard tiles" stop you in your tracks. It's not tough to get around, but if you do make a wrong turn, you'll usually end up back at a common crossroads. If that happens, just pick a different path and try again. Also, if you're looking for some extra cash, search around near TM10 and you'll find a secret Nugget! The Nugget is directly next to TM10 to the right. TM10 contains Double-Edge, a powerful Normal-type attack but it also damages the user per use. A great move to teach to your Pokémon if you cannot afford teaching Body Slam to them. Once you have the elevator working, fight Rocket #5 on B1 to get out of the Hideout and heal before you fight the bosses. 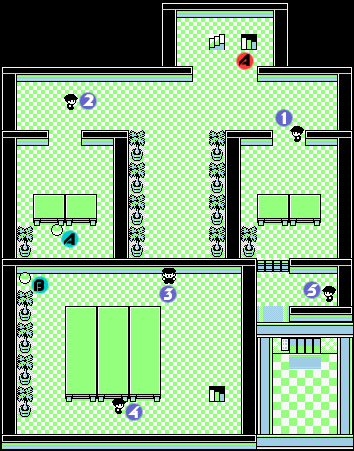 Things differ a bit on the bottom floor: Yellow players get a second visit from Jessie and James, while Red and Blue have to defeat two extra guards at the door. They shouldn't be tough to face. Team Rocket must have gotten word that you were coming. In the Yellow version, Jessie and James aren't going to just let you waltz into the office and confront Giovanni, and neither will the guards in the Red and Blue versions; besides, they're eager for revenge after you stopped them at Mt. Moon. In Yellow, Jessie and James will have their traditional team ready, but the Koffing, Ekans and Meowth won't be very strong at this point. If you have Ground or Psychic-type Pokémon, the battle should be a piece of cake. The guards in the Red and Blue versions will have some Ground and Poison-types at their disposal. Water and Grass will deal with the Ground-types, and Ground and Psychic types will take care of the Poison-types. After defeating the grunts, go forward to face the Rocket Boss. The Boss himself isn't tough so you should do fine against him. Giovanni has an Onix and a Rhyhorn in all three versions of the game, but in Red and Blue he will also come at you with a Kangaskhan. In the Yellow game, his third Pokémon will be a Persian, but no matter which pak you're playing, his Pokémon will all be around levels 25 to 27. Strong Water, Grass or Ice-type Pokémon should be all you'll need to K.O. his team. After the fight you'll receive the Silph Scope, which is required in the fight with the ghost at the top of Pokémon Tower. Check the machine Giovanni was standing in front of to find a hidden Super Potion. This page was last edited on 26 January 2017, at 17:07. This page has been accessed 1,128,515 times.